her talent and spirit in the water, not to mention that brilliant blonde hair catches the Hawai‘i sunlight too. A Waikiki local, the preteen has only been surfing for a few years, but already cross steps and nose rides with a classic, graceful style. Competing in local longboard events like the China Uemura Wahine Classic this past June and Duke’s OceanFest in August, Haley is on a progressive path and will likely catch more speed this winter. Since surfing is the only thing on this wahine’s mind, Freesurf decided to get personal and learn more about this up-and-coming surfer girl. Check out this month’s She Rips interview with Ms. Haley Otto. Tell us about your first wave memory? My first wave was at Baby Queens when I was eight years old. My dad’s friend let me try an old shortboard he kept on his lanai. I stood up on the second wave and have been stoked ever since! My best competitive achievement would have to be winning the 2015 T&C Grom Contest. The waves were pretty small and inconsistent that day. In my final, I was the only one who stayed out at Queens. The rest of the girls came in and caught little waves at Babys. I followed my heart and caught a couple good ones that put me in first. One day after school when the conditions were perfect and the water was glassy. I scored lots of hang tens that day! My mind is my biggest competitor right now. I am learning to mentally block everything and everyone out during a contest and just focus on finding the right waves. Who do you love to surf with most? I love to free surf with my friends because it’s just super fun and we encourage each other. I have learned a lot from them. Honolua Blomfield and Vanina Walsh are my favorite female surfers because they are both very humble and they both rip! My favorite male surfer is Arthur “TOOTS” Anchinges because he has an amazing classic longboard style. My biggest inspirations are my Mom and Dad. They support me and inspire me to follow my dreams. Have you ever gone on a surf trip? I have not gone on a surf trip yet. My dream is to travel to Malibu and surf the California coast. School and surfing, surfing, and more surfing. To place in the Longboard division in the upcoming North Shore Menehune Contest. My ultimate goal is to travel the world competing. 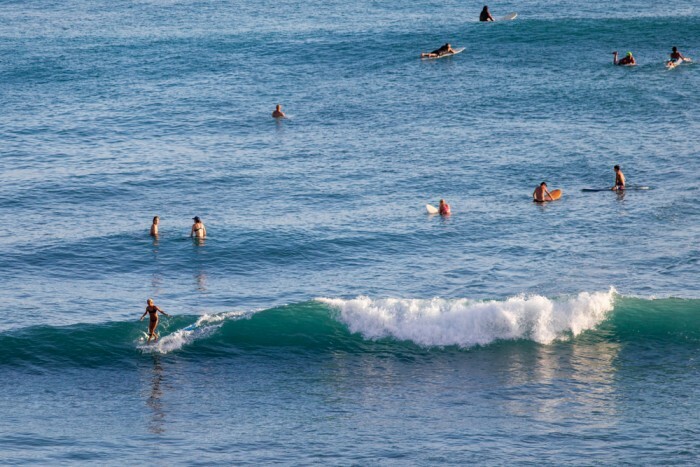 Best part about living and surfing in Hawai’i? The temperature and there are always waves somewhere!